Aussie remains the weakest currency in the FX atmosphere. Intraday shallow recovery reverted, as Wall Street lost initial momentum. The Australian dollar remains among the weakest currencies across the FX board, trading not far from its multi-year low of 0.7098. 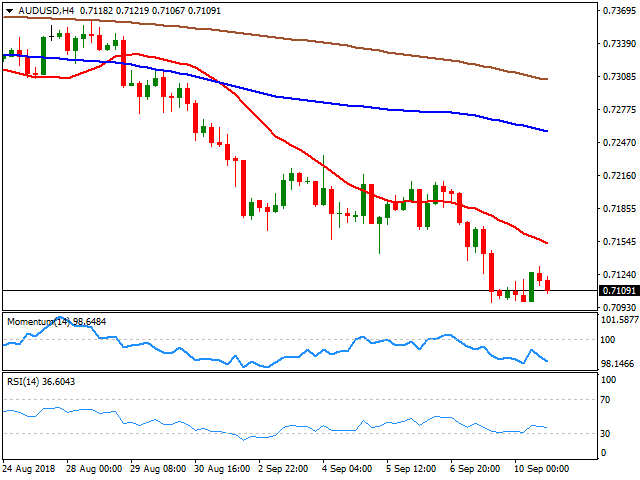 The pair retested the low posted Friday and hit an intraday high of 0.7131, but the shallow advance could clearly be attributed to decreased dollar's demand than Aussie's self-strength. US equities opened with a strong tone but trimmed most of their gains, adding pressure on the commodity-linked currency. At the beginning of the day, China released its August inflation data, with the monthly CPI hitting 0.7% and the yearly reading printing 2.3%, a six-month high. During the upcoming session, Australia will release its NAB's Business Conditions an Business Confidence indexes for July, while China will unveil minor money data. The pair maintains its bearish potential intact, with scope to extend the ongoing downward move to 0.6826, January 2016 monthly low, as the latest consolidation has helped the pair to correct part of its extreme oversold conditions. Short-term, and according to the 4 hours chart, the pair has stalled its intraday recovery well below firmly bearish moving averages, while technical indicators resumed their declines after an upward corrective movement within negative levels, the Momentum now at fresh 1-week lows and the RSI at 36.